Time for the prize-predicting. News (good) of Terry Gilliam. One I would mention for sure is Bi Gan's Long Day's Journey Into Night, which I'm pretty sure is one of the, thrillingly brilliant films of the festival, quite possibly the most thrillingly brilliant one. His debut Kaili Blues, seen by me in New Directors/New Films, was a uniquely memorable thrill. It would also be fun to list all the turkeys that have been reported on in the festival, and make a mini-festival feasting on them. To ponder on the mistaken reasons for including in such a prestigious and elegant event so much sheer expendable junk. Terry Gilliam's long-pursued Don Quixote comedy will, as announced, be shown as the closing film at Cannes, tomorrow, Saturday May 19, opening in Paris the same evening, UK (or US) dates to be announced. Gilliam has now explained, in a Guardian article that while the symptoms were similar, what he had, "less painful than a stubbed toe," was a perforated medullary artery, something more minor than a stroke. And he is fine now, and will be on hand for the debut of the movie it's taken him decades and required overcoming so many obstacles to complete. Last edited by Chris Knipp; 05-19-2018 at 07:12 PM. 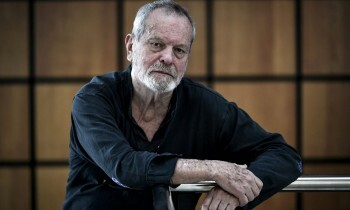 The Man Who Killed Don Quixote (Terry Gilliam). The film has been shown a day early to the press; Peter Debruge reviews it for Variety. In Miguel de Cervantes' great Spanish classic, Don Quixote was a man who read too many chivalric romances and thought he was a heroic knight. Gilliam's movie is, instead, about a contemporary man who starts to think he is Don Quixote. Debruge says the story fits Gilliam himself, sort of, because he's a "quixotic" sort of fellow himself; but, sadly, the story and the dream are better than the actual movie, which is "what the director’s fans most feared: a lumbering, confused, and cacophonous mess." Pryce's sonorous voices sounds braying due to over-high sound mix and Driver is saddled with too many F-words. I am sure that we will go to see it anyway, if we love "Monty Python" and Terry, or Adam Driver, or Cervantes, or all of the above. The story shows a maker of advertising shorts, Toby (Driver), wasting his life and moral fiber, who's drawn back to an old movie he made as a student based on Don Quixote and wants to find the people he cast in the main roles years ago. When he finds the humble shoemaker (Pryce) he'd cast as Quixote, turns out the man has lived all these years deluded that he is the Mournful Knight, and now mistakes Toby for Sancho Panza. But Gilliam jumbles the line between reality and fantasy here that he kept helpfully clear in his more successful 12 Monkeys and The Fisher King, according to Debruge. As one perhaps would expect, the Brit Bradshaw is kinder in his 3/5-stars Guardian review, hailing "a film of sweet gaiety and cheerful good nature." You decide. Last edited by Chris Knipp; 05-19-2018 at 07:13 PM. The Wild Pear Tree is another big Cannes awards candidate, along with Burning, Shoplifters, Happy As Lazzaro, Ash Is Purest White andCold war, with Dogman, Leto and BlacKKKlansman. making a "top nine" of Competition favorites. The title (Айка) means "My Little One." 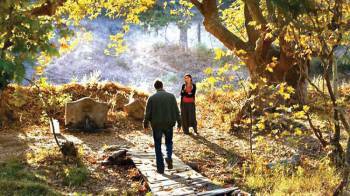 Not so big, not so anticipated, as Ceylan's, by the director of the ethnographic, vivid, memorable but not great (in my opinion) Tulpan (NYFF 2008). That was Un Certain Regard; this is Competition. Using the same female star as the earlier movie, Samal Yeslyamova, who provides "an intense, committed performance," this seems like the Dardennes' Rosetta, says Leslie Felperin in her Hollywood Reporter review. Ayka starts by escaping out the window of a maternity ward to go back to work, knowing she's unable to support a baby. Perhaps Zain of Nadine Labaki's Capernaum would approve this realistic gesture. Then she runs around looking for different jobs. "Dvortsevoy deserves praise for making a film willing to show a woman ready to do anything she can to live," Felperin concludes. Last edited by Chris Knipp; 05-24-2018 at 05:48 PM. P.s. : He got one right: Marcello Fonte, Best Actor - a prize many agreed with. Last edited by Chris Knipp; 05-19-2018 at 08:16 PM. My (premature) comments: I have not seen any of the Competition films, not even watched the trailers, but I'd say from following reports, the predictions that this was a lackluster year were quite wrong: there were a lot of fine films. Just look again at the Screen Jury Grid of the 15th. At least the top seven sounded superb, or important (Godard), and beyond that Honoré is a personal favorite of mine for his gay-friendly, youthful pictures steeped in French New Wave traditions and with engaging actors; I have a personal relation to Egypt, so even if A.B. Shoukry's admission to Cannes Competition was a bit premature, I'd find his movie of interest. Heck, even the generally reviled Girls of the Sun has the gorgeous and vivacious Golshifteh Farahani in a key role. After these came films by Stéphane Brisé (once again with the great, by now one could say iconic, Vincent Lindon), and Lee Chang-dong's Burning, which got the Jury Grid critics' highest raing in Jury Grid history! Not too shabby. .
And that's just the Competition films. We haven't gotten to Un Certain Regard and Critics Week and Directors' Fortnight. The "Festival de Cannes" is still a pretty neat place to spend 12 days in spring if you're a cinephile, none better. Last edited by Chris Knipp; 05-19-2018 at 08:37 PM. I'm feeling good about the fact that Spike Lee is going away very happy with the Grand Prix. BlacKKKlansman clearly is his liveliest, most committed work in years, and he liked its starting out with high international recognition. It's notable that the transgender film Girl, a strong debut, got four prizes, the Un Certain Regard acting prize, the FIPRESCI award, the Caméra d'Or, and the Queer Palm, and Burning did get compensation in the Competition FIPRESCI award. Just remember: being in the Cannes Film Festival is an award in itself, the biggest award the world of cinema has to offer. And what happens at Cannes during these twelve days is seen around the world, whether it's Kristen Stewart taking her Louboutin spike heels to walk up the red stairway or Spike cursing at his press conference or a brilliant or bold new movie director hitting the silver screen. P.s. : I have missed the commentaries and "Tweet reviews" of Mike D'Angelo very much, this Cannes. I have followed D'Angelo at Cannes (and Toronto) since his Open Letter to Lars von Trier, Cannes for AV Club, May 2009, made me a convert. Last edited by Chris Knipp; 05-20-2018 at 08:25 PM. 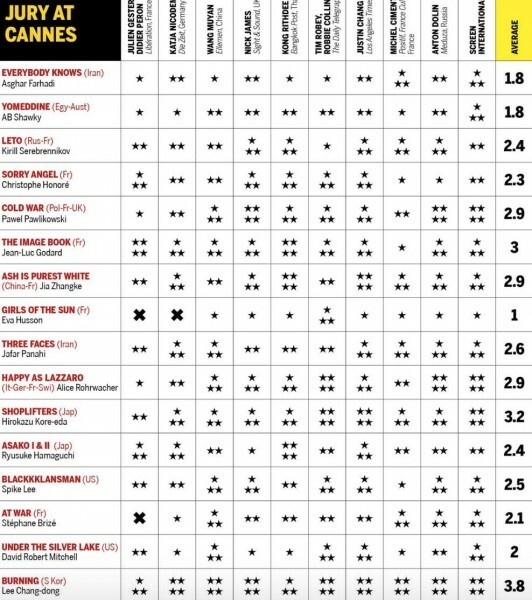 Metacritic editor Keith Kimball has a 2018 Cannes roundup - "2018 CANNES FILM FESTIVAL RECAP & REVIEWS" today of the main films in all the main categories ("Not such a bad year after all"), and actually finds that statistically this was a better year for movies, more with top 90% Metascores, than 2017. The summary is followed by the "best and worst" of the Festival (though a lot of the "worst" aren't that bad, just in the 60's), with the Metacritc pages for the main films all in one thread. I still refuse to believe Under the Silver Lake, isn't cool despite a low percentage here, and some of the 60's could be much more interesting than that implies, but Metacritic still does reflect the reviews more precisely than my more hasty and impressionistic reports might have done. Don't give up on me though! I still reported on the films day by day and even hour by hour, and that's worth something. Last edited by Chris Knipp; 05-20-2018 at 08:21 PM. A last look at the last or nearly last Studio Jury Grid. This is considered an indicator of the international critical assessment of the Cannes Competition films. Burning was the record high with 3.8. Shoplifters (Korreda) won 3.2 (and the Palme d'Or). Godard's The Image Book got 3.0. 2.5 to Three Faces (Jafar Panahi) and BlacKKKlansman (Spike Lee, who won the Grand Prix, the no. 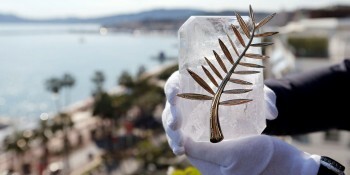 2 Competition award at Cannes). Burning did win the FIPRESCI Competition prize, but not one of the top Competition Jury awards. So there are the top nine. Notice Nadine Labaki's Jury Prize winning Capernaum , a sentimental favorite for its timely refugee theme, got some very low scores including the x ("bad") scroe and an average of only 1.9, between David Robert Mitchell's cool-sounding (to me) Silver Lake (2) but above the least-favorite, Eva Husson's Girls of the Son. The opener Farhadi's Everybody Knows and the perhaps mis-categorized Yomeddine ((1.8). Terry Gilliam's The Man Who Killed Don Quixote was of course not in competition, hence not on this grid, but I fear its Metacritic score, so far, is a meager 56 based on nine reviews. Remember, the Metascores and details about the high-scoring Cannes 2018 films can be found summarized here: CLICK. Last edited by Chris Knipp; 05-25-2018 at 12:58 PM.